Watch Tim Cook's full interview calming fears over Apple losing momentum: "Customers love our products"
Shares of Apple have been rapidly going down in the week after the company unveiled results slightly short of analysts expectations, but in line with Apple's own guidance for weaker iPhone 6s sales. China in particular has taken a big hit in sales. All of this has investors worried, but the withdrawal from Apple stock might be a bit of an overreaction. We've already told you about the gist of Tim Cook's appearance on CNBC's Mad Money with Jim Cramer, where the Apple chief executive calmed fears over this being some kind of 'an end' for the company's success and pointed out that it was still a great quarter. In fact, in the past 'weak' quarter, Apple still made some $10 billion in profits, more than its three biggest rivals, Facebook, Google, and Microsoft combined. 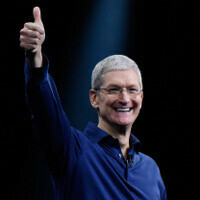 So what did Tim Cook say to calm the fears? A couple of things: first, without revealing any details, he mentioned that the next iPhone will have some truly innovative features with innovation that will work on a level so deep that people will feel like they need it in their lives, and secondly, he shared his optimistic thoughts on the Apple Watch that Cook thinks will grow on people over time with all the additional information that it provides. If you want the full story, though, you have to watch the whole interview that is now available, and you can tune in right below. Honestly I heavily believe Apple would not be as great if celebrity did not push there product as the cool to have then they would not be worth that much. Not to take away from Jobs foundation he built. Tim Cook is a for profit type of person and he now is breaking a sweat because he can't innovate he just duplicates. Their products are actually still respectable, not just "cool to have". Sure, they could be trailing behind competitors but honestly the whole smartphone market is getting saturated right now. People might love their products. However most do not love Apples pricing. It's not always can you afford the devices or not. It's also are you getting your monies worth. Especially when you see the competition always releasing new and improved products all the time with more features and better pricing than what Apple offers. The pricing amongst the competition is fierce and has always been better than what Apple has ever offered. But over the years the competition hardware has continued to improve and surpassed what Apple has to offer. The iPhones today do not have the best displays, cameras, battery life, and the competition also offer things not found on any iPhones like higher resolution displays QHD (Used for VR), wireless charging, expandable storage, IR blasters, removable batteries, waterproofing, IRIS or face scanners, and more. Consumers are left to what Apple gives you, or what they decide to come up with every year. The tons of competition in the other camps have new and improved hardware every month. As it stands today Apples hardware only exceeds in price compared to the competition. With Jony Ive voice: "We crafted this mark with sophisticated tools, laser cut to the finest nano-meter of detail and accuracy, filled with the most premium materials ever, fully polished to the microscopic details to give a remarkable finish. This changes everything." All flagship phones cost to much. Case in point: Apple IPhone 6s Plus: 849.00 Samsung S7 Edge: 899.00 Some of the features you mentioned mean absolutely nothing to consumers at large. Do you think a 52 year old man gives a damn about VR? Hell no. It is also physically impossible to see pixels on any 1080p smartphone at normal viewing distance. So you have basically created a placebo effect on an entire market, making it sound revolutionary when in reality you are only degrading battery life. There are only two phones with an IRIS scanner (lumia 950/XL) and by all accounts, those two phones are a flop. They have literally sold less that 1/50 to the IPhone. And removable batteries are disappearing because they compromise device integrity. IR blaster and expandable storage are also disappearing from today's flagship. Literally every "feature" you gave means nothing to the average person looking for a phone. If they have a vested interest in IOS, they buy an IPhone. That is the way it goes. All these Apple articles have seemingly brainwashed everyone here to think Apple is in the red. Welp....they aren't. Clickbait left and right just like Samsung 2 years ago to the very quarter. Sad really, that as smart as most of you are, you can't even examine the market you claim to know. I can't believe you even listed VR as a reason, knowing full well only the nerdiest of nerds give any s**ts that it exists. Consumers have always been left with what Apple gives them, and people buy IPhones regardless. That won't change just cuz tech enthusiasts (basically phone nerds) preach about other options because there has always been other options. Some people simply prefer IOS. Kiko007 shows what you know. Every flagship Android phone right now has expandable storage. Wireless charging has been on every Samsung flagship for years now. Not to mention a number of other devices. Waterproofing has been on a number of flagship devices for years. The best cameras right now are not on any iPhones. What about all the crap with Apple Zealot's like yourself saying for years that Apple has the best displays for years. Yet I haven't heard that in years. Just like RAM was recently upgraded to 2gb on iPhones, when many of the imorons were telling everyone that iOS is more efficient and doesn't need 2gb of RAM. Yet Apples own Swift runtime requires more RAM. Plus many watch apps currently run on the iPhone itself. Apps grow and get larger over time with more functionality. Why did Apple put 4gb of RAM on their iPad pro? If it's their developers can take advantage of what ever resources are on a device. If it's not there, then naturally they can't take advantage of the RAM or what ever is missing from a device. If you can't see that Apple has been controlling you, and holding your hardware back. Then you are an idiot. I guess you can be happy and wait for what Apple will give to you in the future. Oh BTW Kiro007, your point about all flagships costing too much is correct. Except the part where you try to make the iPhone 6s plus seem less expensive. Only a real idiot would buy a 16gb iPhone 6s plus. Where as the Galaxy S7 edge has a curved edge display that has extra features and a larger battery, and it comes with 32gb of of expandable storage. Also if you don't want the S7 edge, then you can take $100 off. So ultimately the S7 is less money than the iPhone 6s plus. That price was related to the 64Gb version of the 6s Plus, not 16Gb. And the reason I chose both those models is because they are their OEMs true flagships. There are no price cutting measures involved here. I'm more surprises that as supposably "informed" you are, you don't even know the starting price of the phone you hate so much. And there is no way in hell I'd ever pay that much outright for any Android phone..... period! It'll stop getting software updates after 1.5 years (give or take depending on the OEM). Not to mention I can get a cheaper Android with the exact same features for $400 dollars less. Can you get the latest IPhone features on an older model? Technically no. While I can get the latest IOS fixes, I can't get 3d touch or the 12 MP camera by purchasing an IPhone 6. We have different perspectives and needs. You need a bunch of useless bulls**t, and I don't. Simple as that. kiko007 iphone in others countries than USA cost as much in 16 gb model as the S7 cost. so i would not try to play around with price as Apple price point in others country is simply crooked. As for software updates. my HTC M7 released 3 years ago is rocking latest android version. but the main point here is i dont need latest OS update i only need latest API to run all app on android. I also dont need buggy OS update thats break my phone and make it slow so i stay with less OS update if its mean my phone work better overall. you can get almost everything 3d touch give by software. As for 12 mp camera beside great 4k video its about the same as the 8 mp in iphone 6 lol. As for different perspectives i disagree. With android you have choice see i can take a Samsung filled with features ( as you say bunch of useless bulls**t ) or i can get an HTC 10 and this will give you similar experience to iphone ( you install app to get features ) So i agree with you i dont like phone filled with crap bulls**t i never use but with android i have option to take phone from OEM thats dont do this. I HAVE CHOICE. And if i switch to another OEM i dont loose anything. So be happy with no choice but i am happy with lots of choice. If tomorow iOS start to be sold on others brand of OEM i will get one as i do like the clean UI. I'm not an "Apple zealot" as you so eloquently put it, I use Android as well. However, you seem to not want to look at things logically from a normal consumer's perspective. I'm sure you have friends who use IPhones, ask them how many s**ts they give about your 2k display. Ask them how much they give a damn about VR. People don't buy IPhones for bulls**t 17 years olds care about. They buy them because they have a vested interest in the platform. And calling people names just because they don't agree with you only makes you look incredibly ignorant. You are the reason I would never recommend Android to anyone I know. Because dealing with you "Zealots" is far worse than any IPhone User I've ever met. Actually 2GB RAM was the only thing a lot of iPhone users wanted for quite some time. And yes iOS is more efficient. That's why the iPhone doesn't have 6GB of RAM like some Android devices need and is still smoother as almost all other phones out there. And the reason the iPad Pro has 4GB of RAM is simply because of multitasking. They just can't put 2GB of RAM in there if they want to provide a smooth experience. Seeing pixels isn't the only issue with lower res displays, sharpness differences are notable. The human eye can notice differences down to about 600ppi at normal office viewing distance. Use the device in VR, and it will make a difference. kiko007 you are truly in denial. 52 year non techy ppl dont get a smartphone or just get a low cost one. its possible to see difference on 5 inch and more screen with naked eye between QHD and 1080p also the quality of the pannel can be seen naked eye ( just tell me S7 screen not better looking overwall just try ) Iris scanner is next step after finger print scanner wana bet in a few year its will be the next standard? removable battery are disappearing mainly because its cost less to have them fused inside the body. expandable storage are disappearing from today flagship? really? S6 removed it... what happened in S7? idiot... only part you are right is if ppl are too invested in ios ( apps , ipad , mac ect ) they will stay with apple and i also recommend it. I would love an iOS device but not from Apple. "Iris scanner is next step after finger print scanner" What the..?? A iris scanner will never replace fingerprint scanners. At least not on smartphones. Can you get your Iris scanned when it's dark? Can you get it scanned when you are looking away from the phone? No? Because you can do these things with a fingerprint sensor. There is absolutely no need for a Iris scanner on smartphones if you can use a simple fingerprint sensor with a lot less disadvantages to unlock your phone in 0.1 seconds. And removable batteries get removed because they limit in how the phone can be designed. A lot of Android phone makers realized that the phones they make look bad and replaced the removable battery for a better design. Absolutely nothing you said was accurate (especially about hi-res screens and VR) or worthwhile. Your entire post was nothing but a desperate apology for Apple's lack of innovation/intuition disguised as a rant/attack on the original poster's comments. You didn't disprove anything he/she stated. Apple's products are overpriced and overhyped. Apple charges you a premium for outdated hardware and offers little to nothing to justify the price. Apple's products are mediocre at best and no where near the technological advancements that Apple wants you to believe. You want "phone nerds" to stop badmouthing Apple? Then you and your phone illiterate brethren need to stop claiming that the iPhone is the "best" in any of the technology features categories that it competes in (battery, screen quality, camera, etc) and we will quit calling you (and Apple) out on your mistakes. We all agree that the iPhone is a good feature phone, and even a halfway decent smartphone. However, calling the iPhone the best or worshipping Apple as an innovator in technology will cause us to respond negatively to your post because it just isn't true. Lmfao....What? When did I say Apple had the best anything? Never. When did I say I was trying to disprove what he said? Again, never. As if I would care what some hipster nerd gives a s**t about. I don't think you know what the word "apology" means apparently. I said people do not care about VR because guess what...they don't. Most people don't even know what VR stands for. Just because some SAO fanboys say something is popular, doesn't make it so. And don't get me started on this whole: "You have attacked Android pride" bulls**t. That my friend, is called a cult, and you apparently are apart of it. The word "worship" fits you way better than me. You described Android as if it were a living breathing entity that needs to be defended which is kinda f**kin creepy honestly. I own a phone from all three platforms, and I've never felt as attached as you do. Again... overpriced and overhyped are subjective terms. I can say the LG G5 is overpriced and overhyped, does that make it true? Probably not. And seeing as sales records back my opinion, I say checkmate. Lastly, I don't give a single f**k about people bashing whatever. I simply can't stand the spread of ignorance and false information. Thats thanks to what called competition. How many OEM make android device? How many OEM make iOS device? You have the response there. Apple market for smartphones may be saturated, but there are several untapped markets. Apple simply can't make products for them because, as Apple said; we can't make cheap products that wouldn't be a piece of crap. So they chose to make expensive products that are a piece of crap. Not saying they are actually crap in that terminology. Its more of the value vs the pricing. If Apple actually priced their products where they should be based on what they offer, they could be afford by other markets. There are 7 billion people on this planet. Roughly a 3rd own a phone. In China alone there are over 1Billion people, would would probably have a phone if they could afford one. Apple simply would not be an option for them because of cost. To bad they don't have Governement phones liek the USA. Not saying those cheap phones are all that great. But for as much as the Chinese Gov't take from its own people, they could set up a program, which would help make such options cheaper for their own citizens. Not saying they have to have an iPhone. But there are cheaper options. That si why OnePlus, Samsung, Vivo, Xiaomi and so many others are still selling large amounts of phones because they are able and willing to offer a product for this market. Apple won't do this because it would prove their brand isn't as premium as it is claimed. But Apple moved much forward under the reign of tim cook,like bigger screen,higher resolution display(even if only on 6s plus),stylus etc. Don't get me wrong,but jobs was kind of a jerk,like blaming your customers for bad antenna"u r holding it wrong", sueing other companies over silly things,blasting Samsung for their amoled display. People say jobs was better than cook but, when you look at it as a whole Apple has moved much forward under cook. Hybrids devices (surface line up)are emerging and not merging iOS and Mac together because he wants to sell you do many devices at high profit margins also hurts. Wrong move tim. Promise your investors of the new innovations you'll bring to the company, saying customers love your products without good reason means that apple is just a fad and will be gone in 2 years. I agree. I can't wait to see Apple burn to the ground. Not 2 years. Apple can recover very easily. But at thsi point, there only recovery would be making iOS more liek Android and Apple won't do this because they are arrogant and stupid. It will take longer than 2 years. But, right now Appel has all their eggs in one basket. It was the same with the Mac and the same with the iPod. Apple can't afford to just rely on one product to be a money maker. They are not Intel, Coca-Cola or Microsoft. If Apple sales of the iPhone continue to drop and Apple cant come up with the next fad device, then iPhone wont be able to sustain a company with 99,000 employees. I'm curious why they have so many employees, when they don't even make there own products. Its takes that many people do write an OS? Design a phone and laptop? People are goign to get dismissed. Not sure if Apple will become liek Blackberry. Because Blackberry has services to offer that still make money. No one is goign to buy Apple's services, because Apple's own services are based on Microsoft Azure, they also use Exchange and more. That is why Apple wants to bring everything in-house because they know their money is goign to start to drop and the less they spend the better. After all, you can't have 99,000 people sitting around doing nothing. Also that new building is goign to cost some serious cash to keep running. My advice is get rid of Cook and get someone inside who understand this business. Apple needs to diversify or they will die a horrible death. "the next iPhone will have some truly innovative features with innovation that will work on a level so deep that people will feel like they need it in their lives" He said something similar about the Apple watch. Meanwhile, >95% of Apple iPhone owners disagreed (they didn't buy one), never mind the other 80% of the smartphone market, not even hesitating to get one in conjunction with an iPhone. In other words, not so "needed" after all.